Saint Patrick’s Day is almost upon us, and lots of celebrations coming up, as everyone is feeling Irish that day. My son-in-law is of Irish decent, and as always, he and my daughter are hosting a party for family and friends. Since he is my favorite son-in-law, I decided to prepare an Irish recipe, and post it on my blog, for all of you to try out. Potatoes are a very popular vegetable for the Irish, so I will be sharing a recipe for Irish Potato Pancakes, which I found in a “Simply Potatoes” cook/craft book. They were quick and easy to prepare, and great tasting as well. I loved the bacon flavoring, and the tangy taste created by the cheddar cheese. Vegetarians may omit the bacon, and add their favorite shredded veggies. 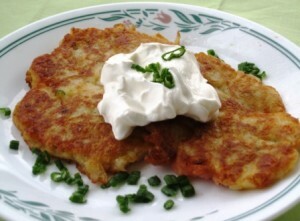 These potato pancakes may be served with sour cream, apple sauce, or with breakfast sausage and eggs. This recipe yields about 12 medium size pancakes. These are also delicious served with apple sauce. 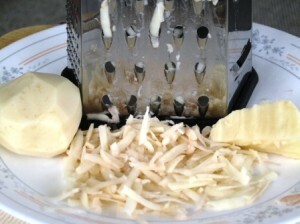 Grate the potatoes, using the “large eye” side of a grater. The potato pancake batter is ready for frying. 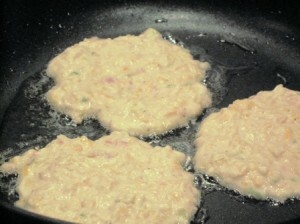 Place an overflowing 1/4 cup of potato pancake batter into a pan for frying. In a medium skillet, fry the bacon and onions, until browned. Peel 1 large, or 2 small potatoes. Grate the potatoes, using the "large eye" grater side. 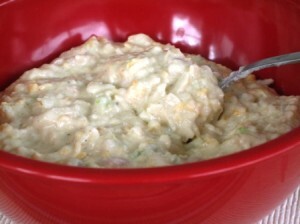 In a large bowl, add the mashed potatoes, grated potatoes, bacon and onion, Bisquick mix, cheddar cheese, and pepper. Using a spoon, mix all in, until well incorporated. Fold in the beaten egg, and milk. Add about 2 Tbs. of canola oil into your non-stick frying pan, and heat up on medium heat. about 2 minutes on each side. I turn them over for the first time, when the edges start getting golden and little craters form. For best results, use a wide spatula for turning them over. Once both sides are nicely cooked, remove into a serving platter, and continue with the rest of the batter. For best results, serve as soon as done. However, they are still great reheated in a toaster oven, or in a pan. Oh these look so yummy!! I never really used Bisquick much until recently, and this looks like a great new recipe to try. Wow this does look like a very tasty recipe! Especially if you have leftover mashed potatoes from another meal.. Thank you. We liked them a lot. 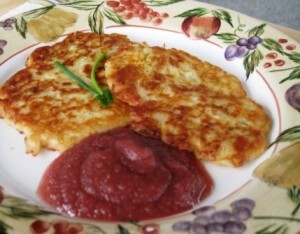 I made regular potato pancakes before, but this recipe was much better. Thank you for stopping by, and for your comments. Yes, I love creating new meals out of leftovers. Ingredients these days are quite expensive, so reusing leftovers is a wonderful way to stretching your dollar and enjoying a tasty meal. Thank you so much for reading my posts and for your comments.